Episodic games are a pretty big deal these days. With the excellent The Walking Dead series between seasons, you might be hankering for a quick survival horror fix. 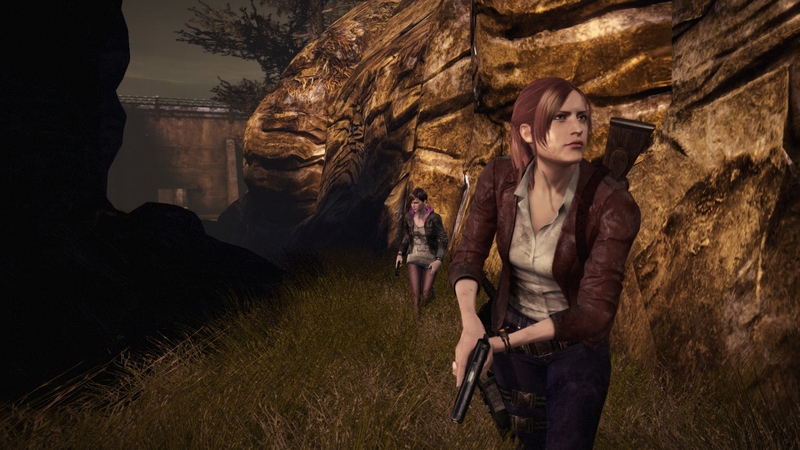 Resident Evil Revelations 2 hopes to fit that bill with Episode 1: Penal Colony. Is it worth your time and money? I’ll answer that pretty quickly with a resounding yes. The first Resident Evil: Revelations was fairly well-received, even once it was ported from the 3DS to home consoles. Capcom was hoping to follow that success up with another in episodic form, and they have mostly succeeded here. Let’s get the ugly out of the way first. Penal Colony doesn’t look particularly flattering. Details and textures feel like a mid-tier PlayStation 3 game, which is disappointing. Enemies only look uglier the closer you get to them, but not because of exposed, dripping sinew. Cut-scenes don’t fair much better, either. This is an episodic game, however, so I suppose you go in expecting lower production values to begin with. I would have just liked to see Capcom put a little more oomph in the visuals. Plot-wise, we haven’t been exposed to much yet. You start as Claire Redfield, the young sister of Chris Redfield. You’re abducted and quickly paired with Moira Burton, who is, as her name suggests, longtime cast member Barry Burton’s daughter. There’s an unknown female who is apparently watching your every move. She occasionally chimes in with cryptic dialogue, blasted out of a speaker on a wristband that has been shackled to the prisoners. When this mysterious woman does speak, the audio comes out of your DualShock 4, which is always a much-appreciated touch. Gunplay is actually pretty enjoyable in Penal Colony. Tank controls are a thing of the past, replaced with a much more standard move-and-shoot mechanic that plays like most any other third-person shooter you’ve tried. Pressing R2 without aiming down your sights will perform a melee attack, which frees up the face buttons to perform other actions. If you’re playing solo, Triangle swaps between the two characters if you are able to do so at that point in the game. Inventory is managed by pressing the touchpad button, and must be done in real-time to add to the classic tension present in Resident Evil. In each of the two scenarios that you play through, one character handles the guns while the other plays a more defensive role. Playing as Moira enables you to use a flashlight (with unobtainium-laced batteries, evidently) to temporarily blind most enemies, enabling Claire to hit ’em when they’re essentially defenseless. Playing as the kinda creepy girl Natalia Korda allows you to use her special ability, where she can sense and see enemies through walls and other obstacles, and can highlight weak spots on the enemies for Barry to exploit. There’s some cool mechanics we haven’t seen in a Resident Evil game before, and it works wonderfully in splitscreen (also much appreciated, Capcom!). If you play solo, expect to do a lot of swapping between the characters, because try as it might, your partner’s AI is just never going to be as helpful as a real-life person. Penal Colony has a tense aura about it, with fitting music and genuine scares with enemies coming out of nowhere. Few enemies are slow, most are quick to attack, and at higher difficulty levels you’ll need to stay sharp and conserve ammo. Knowing when you can take an enemy down with a melee finisher, thus saving a precious round in the process, gets to be pretty crucial. With scant resources available, I hadn’t felt so happy to see a green herb since the original Resident Evil. At only $5.99 for the first episode, there’s a satisfying amount of content. Although the campaign is only around two hours in length, there is a Raid mode that has several missions you are tasked with clearing as completely and efficiently as possible. Do well enough, and you’ll earn BP, which you can use to level up an array of skills. These skills translate to better stats for your characters in the campaign and Raid mode, improving your chances of surviving the higher difficulty settings. These skills make replaying the campaign an appealing proposition. If this first episode is a sign of things to come, I think most Resident Evil fans have a lot of good times to look forward to. While the graphics in Penal Colony are pretty disappointing, the atmosphere, pacing, and amount of content are easily worth the price of admission. You’ll want to grab a friend to play with in order to enjoy this game to its fullest potential. It’ll be interesting to see where Capcom is going to take the story, and those looking for a couple of scares should download a copy of Penal Colony today.